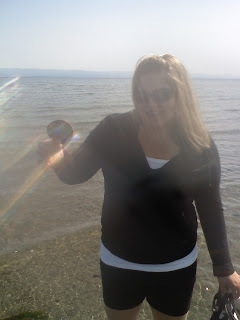 After arriving at Miracle Beach Provincial Park, we went on a drive to check out the Courtenay/Comox area. We took a walk on the beach at Goose Spit Provincial Park near Comox and checked out both towns. After getting back to camp and having some supper, my cousin Chris met up with us and we headed out to fish the Oyster River. Tara was set up with a dry fly, Chris had a wooly bugger, and I used my lucky streamer that I had on from fishing the Quinsam River. 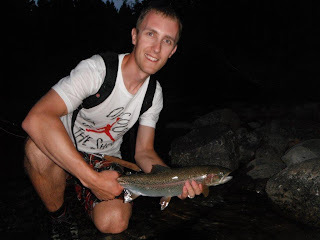 Chris and Tara were getting into some cutthroats, but I wasn't having any luck at the start. Chris mentioned that he had seen a larger fish rising in a nice run, but was unable to get it to take the fly. I slid up in there and after numerous casts, still hadn't seen anything. All of a sudden a fish came out of the wood and striked at my fly but didn't latch on. Two casts later, I had a really good slam, and was into a good sized fish! I thought it might be a pink salmon or something, but as I got it closer to me, realized it was a very nice sea run cutt! We were all super excited to see a beauty trout like that, and we started to fish a little harder to see if one of us could get another nice trout like that! We moved up river and I had another slam and fish on after a few casts! This time it popped off, but we could see pink salmon jumping around so knew what was in the run this time. Tara had a nice 12" cutt on the dry fly, so I went downstream to help her with it, and while that was going on, Chris hooked into a beauty fish! After a short battle, the fish won and took off. Chris got his line back in the water though, and within a couple of casts, he hooked into another fish and the battle was on. After a few minutes, we got a glimpse and initially thought it was another pig cutthroat, but after getting it in closer we realized it was a nice chunky pink salmon! We took a couple of pics and the fish was released back to the river. It was starting to get dark and we headed back downstream. More trout were rising to the dry fly and we caught a couple on the way down. We arrived back at camp happy to have a great evening on the river! The next day we fished the Oyster in a couple of different stretches with Chris and his girlfriend Karen. It was a sunny, hot day and we fished some fine water and saw some cool scenery. Fishing was slow but we managed to get a few cutts and had a great time on the water. We all went for supper and finished off the day by fishing the Puntledge River. The Puntledge was a beautiful river and it was great to get in the water as it was still pretty hot out in the evening. Many people were rafting/tubing down the river on this day and I don't blame them. It looked like a lot of fun, but fly fishing is pretty damn fun too! We fished a few runs and the fishing was a little slow here too, but Chris got a few nice cutts, and near the end Tara got a cutt or two. We changed spots just before dark because Chris really wanted to show me a beautiful spot he knew of. Just me and him headed up with rods, and we started swinging streamers. I cast a few times, then stepped downstream and worked that water. Within 15-20 minutes of swinging, I hooked into something nice! I battled the fish as it ran downstream, then came up and jumped a couple of times. We thought it might be a nice cutthroat, but as it came to the net our excitement went up even more. It was a smaller summer run steelhead, but hey it was a steelhead and we were both excited! I stopped fishing after releasing it back to the water. It was a satisfying day...one I'll remember for awhile! Even with it being a slow day, the few fish we did catch were great, and we had great company too. Chris kept fishing down but was unsuccessful in the next run. It was getting dark so we all piled in the truck and headed back to camp. Tara and I headed to Little Qualicum Falls Provincial Park the next day and set up camp. The area has plenty to see and do, so we checked out Coombs with the whole "Goats on the roof" thing. We ate a huge seafood dinner at the Clam Bucket in Port Alberni, and checked out the Cathedral Grove old cedar forest on the way back. The next day, we went to Cameron Lake in the heat (so no fishing), checked out the Falls on the river, and later in the evening, Chris came by the campground and we fished the Little Qualicum. An Arbutus tree. They shed their own bark and leave a smooth tree trunk..pretty cool! We used dry flies at the beginning and Chris got a couple, but I wasn't catching so I switched to a nymph. After a few casts I was into 3 nice rainbows on 3 casts, but after that....nothing for a while. Chris was starting to get a couple in every run on the dry fly so I switched back to a dry as well. As we walked further away from camp, we were getting some awesome hits on the dry fly and having a blast! After a brief walk through the "jungle" in the dark, we made it back to camp, pretty satisfied with this little creek and the trip as a whole. Fish on! Nice rainbow trout on the dry! Tara and I left back to the mainland of BC the next morning, but we both know we will be back next summer. The fishing was a blast, the company was great, and the scenery was stunning!